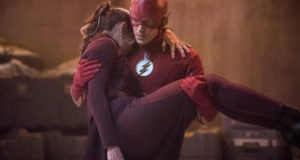 Home / News / Flash “All-Star Team-Up” Description – Felicity & Ray Visit! Flash “All-Star Team-Up” Description – Felicity & Ray Visit! 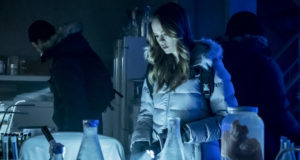 Emily Bett Rickards and Brandon Routh guest star in the April 14 episode of The Flash as Felicity Smoak and Ray Palmer, and it looks like Dr. Tina McGee (Amanda Pays from the original Flash series) is back too! 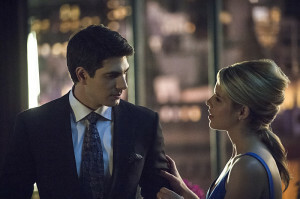 ARROW’S FELICITY SMOAK (EMILY BETT RICKARDS) AND RAY PALMER (BRANDON ROUTH) ARRIVE IN CENTRAL CITY; EMILY KINNEY (“The Walking Dead”) GUETS STARS AS BRIE LARVIN — Barry (Grant Gustin) is surprised when Felicity Smoak (guest star Emily Bett Rickards) arrives from Starling City along with her boyfriend, Ray Palmer (guest star Brandon Routh), who flies in as the Atom. They’ve come to visit S.T.A.R. Labs as Ray needs help with his suit. Their timing turns out to be fortuitous because it’s all hands on deck after a meta human named Brie Larvin (guest star Emily Kinney) unleashes hundreds of robotic bees to attack and kill her former co-workers, including Dr. Tina McGee (guest star Amanda Pays). A group dinner with Barry, Felicity, Ray, Iris (Candice Patton) and Eddie (Rick Cosnett) turns into a disaster. Kevin Tancharoen directed the episode written by Grainne Godfree & Kai Yu Wu (#118). Original airdate 4/14/2015.